The Impression Obsession team and the designers from CardMaker magazine are joining forces today to share a host of projects with you featuring IO stamps! So fun to be hopping with these ladies. If you're hopping in order and came from Daniela's blog, you're doing great! If you missed the beginning of the hop and would like to start from the top, click over to the CardMaker blog. If you'd like to hop with us, drop some glowing comments along the way for a chance to win! 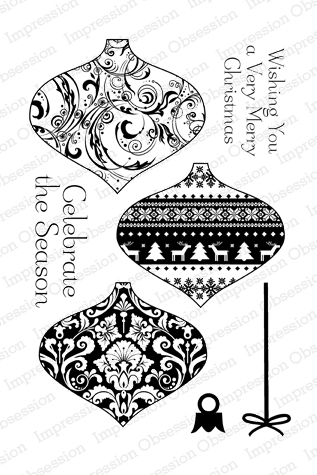 TWO hoppers will be randomly chosen to win a $25 Impression Obsession Gift Certificate on Thursday (12/4) at Midnight CT. Check the IO Blog Dec. 5th to see who won! I started by inking up the round ornament stamp with Versamagic chalk ink, then spritzing before I stamped it to my watercolor panel. I masked the image and did the same with the vintage ornament. After the images were dry, I added several layers of color and shading with QoR watercolors. If you're ready to hop on, head over to Penny Ward's blog - she's got a beauty to share! Here's a complete list of everyone who's hopping today, in case you need to take a break, or you get lost along the way. Enjoy! Remember to comment! love your technique. Beautiful Card. I love watercolor! So 3D looking without the bulk! Awesome work-love the watercoloring! Thanks for being a part of the hop! A lovely card using a technique I have yet to try ... turned out wonderful! This is beautiful, Dini. I love your water coloring technique. Very pretty soft colors. Love the ornaments. Dina this is amazing as always! You are the master of technique - everything you do looks fabulous! Gorgeous color treatment here! love how your technique really made these ornaments pop. Makes you want to decorate. Just beautiful as always, your cards are always so amazing! What a beautiful card! Love the technique! Your work is amazing. The ornaments are so realistic. What pretty colors. Love the technique. Beautiful card, beautiful colors. I also love the water coloring technique! Dina, thanks for being my everyday inspiration. I have learned so much from following your tutorials. You inspire me!! This card is a "must do" on my list of to-dos! Pretty card. Love the dimensional effect. Beautiful ornaments. This card is so elegant. You did a fabulous, fabulous job on your ornaments! I LOVE the dimension on your card. TFS. Great technique for a beautiful card. Beautiful job on the watercolor! Dina, as always, beautiful work. 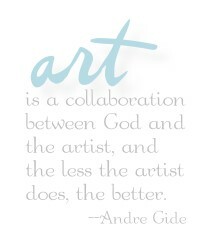 You are an amazing artist. I bet this is even prettier in person. Beautiful card. Thanks for sharing the instructions on how the card was made. one of my favorite card of today, is beautiful, super creative, amazing! I love it! Gorgeous card - love the ornaments. 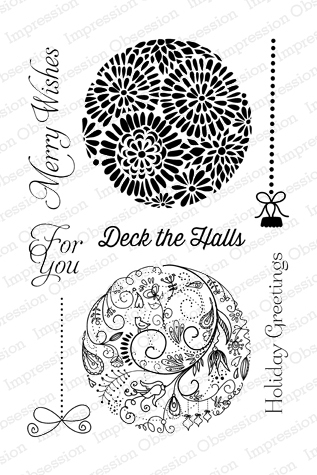 Ohhhh, so pretty and love the two ornament stamp sets! 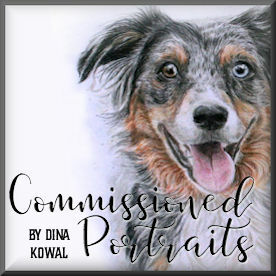 Your work, Dina, is always unique and creative. Beautiful watercoloring!! They look very 3D! Very pretty, cool water color effect. Love the softness of the watercolors. What a great job in creating this card! This honestly is like a work of art!! Love it! I like how you did your card. It would be an "out of the box" technique for me and I need to try this. The vintage ornaments look aged and 3 dimensional with your shadowing! Always am so interested in how's of what u do. So creative. I love the way your ornaments appear to be popping off the card! Your skill in creating these lifelike images is inspiring! Love the watercoloring. Your card is so pretty. Love the vintage feeling of your card, especially when mixed with the busy background floral that adds a playful feel! Love the "watercolor" effect...I need to try this... so beautiful!! great card, love the watercolor. i really have to learn to watercolor. thanks for sharing. Beautiful coloring! I love the shape too. Simply lovely! Great job on the ornaments! Absolutely beautiful! You are a master with color. OMG! I never saw those stamps before and they are gorgeous! But your watercolouring on this card elevates them even more. Outstanding! Nice watercoloring. I like the ornaments. Oh my gosh, I didn't know about the round ornaments 2 set, beautiful! Love your card, those ornaments together are wonderful! Thanks for sharing. Simply beautiful. This is a lovely way to colour an image. I don't have these stamps (probably can't even get them in the UK) but I do have some bauble stamps which may be worth trying this technique with.